Yesterday evening saw the VIP opening of the Richmond Olympic Experience (ROX). This new and highly-interactive exhibition is located within Richmond Olympic Oval, the speed-skating venue for the 2010 Olympic Winter Games. The building itself is remarkable. I’ve worked in it now for months and I’m still struck by the cavernous interior with its beautiful all-wood roof. EDM was responsible for a number of feature interactives as well as the overall exhibition show-control and content-management system. 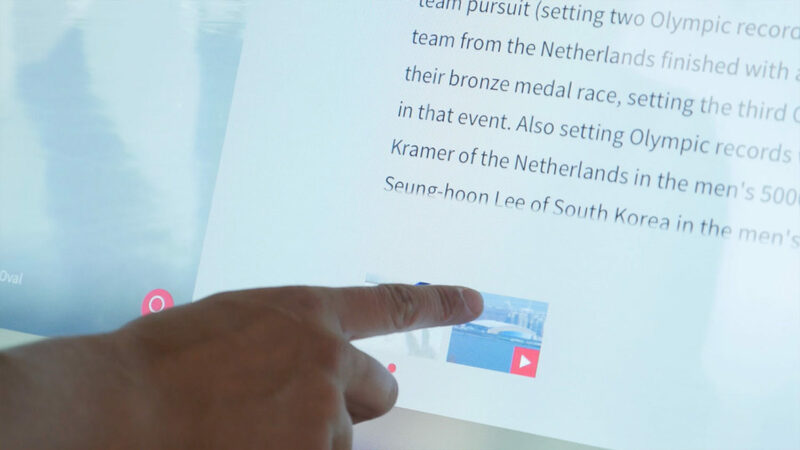 One of the interactives, the Olympic Sporting History touch-table, is a roughly 8 meter-long multitouch timeline featuring hundreds of stories of Olympic achievement dating back to the advent of the modern games. We researched and wrote all of the content, identified and sourced the supporting images and video, designed the interface, and iteratively developed the software. At last night’s opening I spent a fair amount of time observing visitors interact with our various exhibits. The highlight of my evening was being introduced to 1960 Olympic Gold medallist in rowing, Don Arnold. 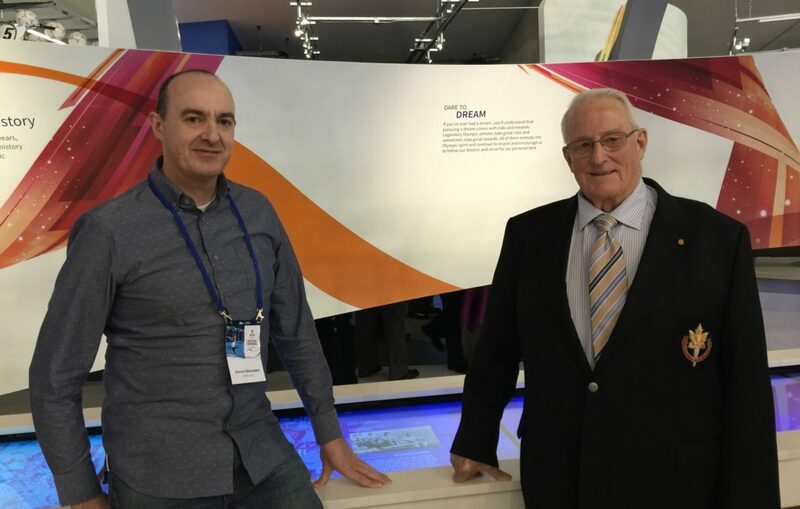 Don’s story is featured on the Olympic Sporting History timeline, and I had the opportunity to hear him expand on his long career in rowing. Don seemed genuinely pleased with his digital cameo and he very graciously posed for photos (see below). For my part, I greatly enjoyed playing even a minor role in recognizing his athletic achievements. I’m sure we’ll write up the ROX project in greater detail at some point. It was a challenge … but on this first large-scale trial seems to have drawn positive reviews from those in attendance. EDM’s Darran Edmundson with 1960 Olympic Gold medalist Don Arnold. 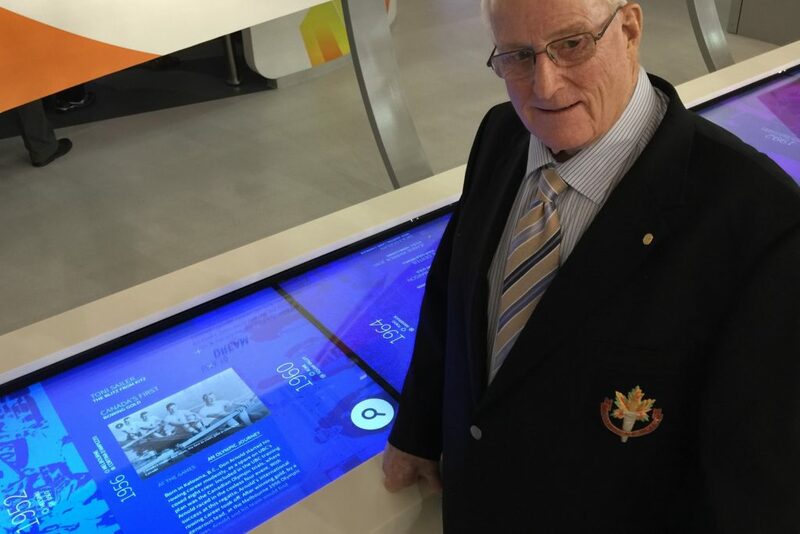 1960 Olympic Gold medalist Don Arnold with his story on ROX’s multi-touch timeline.